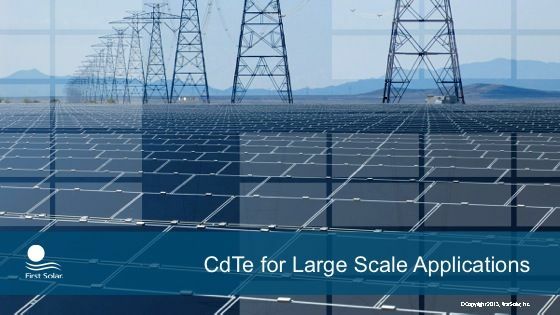 Raffi Garabedian, the CTO of thin-film solar giant First Solar, spoke at an IEEE Silicon Valley solar event earlier this month in a talk entitled,"CdTe and c-Si Under One Roof." -- Why invest in a new c-Si technology when there's already so much capacity? The response is that one technology won't win in all segments. 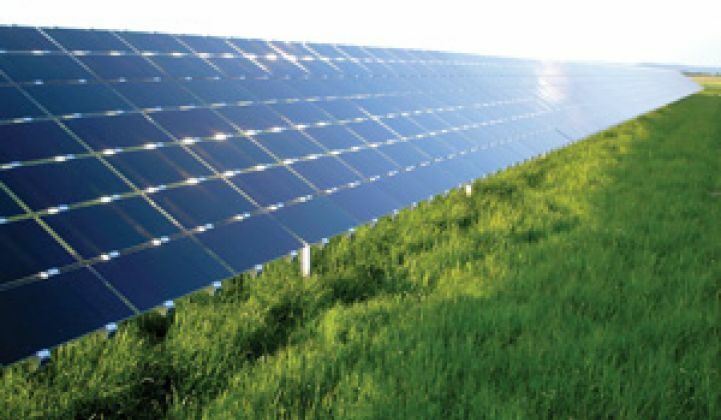 The CTO said, "For one of the top five solar companies in the world, it's pretty obvious we should have a diverse technology portfolio." He said that First Solar can't make money reselling Chinese panels, adding that even the Chinese can't make money selling Chinese panels. Garabedian said, First Solar is preparing its entry for the "space-constrained" market. 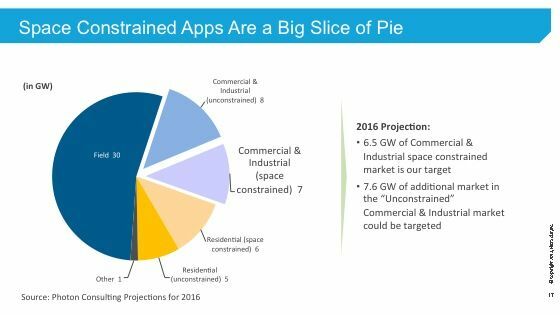 The CTO notes that large commercial and utility-scale solar is driven by pure economics. The residential and small commercial spaces, is driven by different economics. He added, "We don't have a product that plays well in restricted spaces." 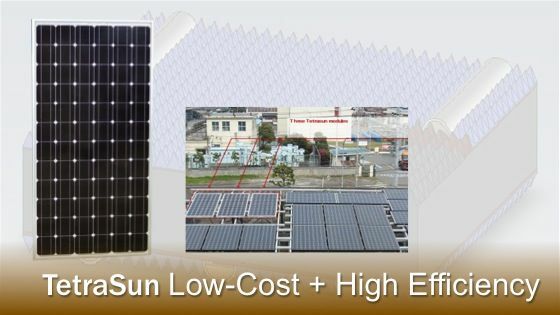 He said it comes down to efficiency and customer behavior, adding, "We need more than one solution if were going to continue to be a very big player in the PV module market." 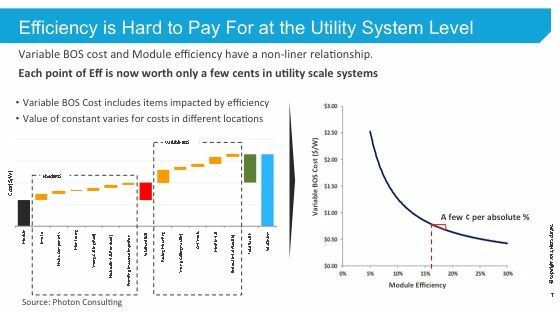 "At the utility scale, efficiency is really hard to pay for," said the CTO, adding, "You end up paying too much for the module, and that doesn't offset your balance-of-system costs." Garabedian said, "We are at 2 cents [per watt] of balance-of-system cost reduction for every absolute 1 percent efficiency improvement." He added that he doesn't understand the economics of SunPower's C7 tracker. 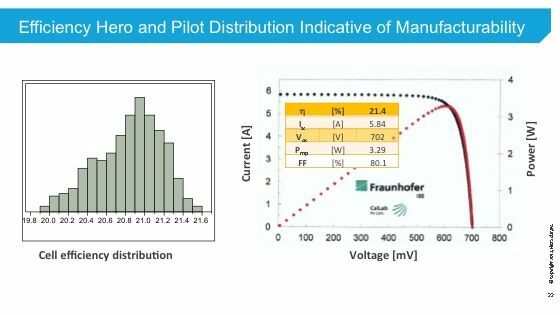 The following graph on LCOE for different generation technologies shows "the LCOE for c-Si PV tends to be slightly higher than for thin film, but that can be improved with tracking." He noted there would be a similar improvement for thin film on trackers. 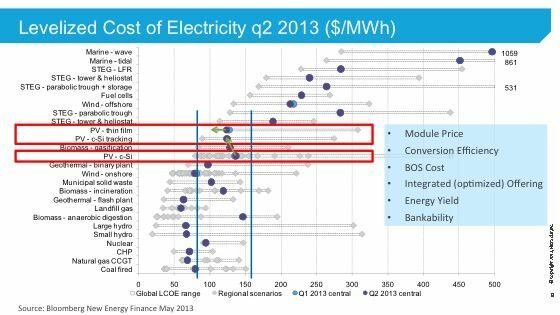 For Garabedian, this shows that "high efficiency doesn't mean low cost at the utility scale." 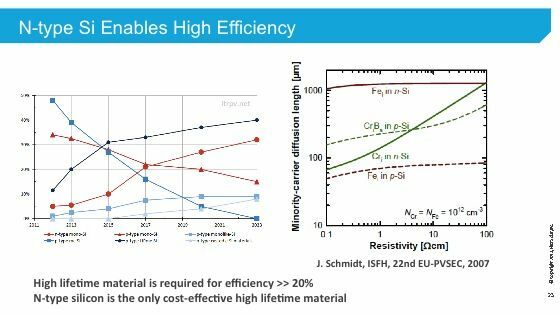 "CdTe and GaAs: You can't get better than those two materials from a Shockley-Queisser limit perspective. It's perfectly matched to the solar spectrum. In fact, we can push the bandgap one way or another by adding a sprinkle of this or a sprinkle of that and get even more. The problem is cad-tel is a polycrystalline material. It's messy, so there are a lot of losses. That's bad news, but it's also good news, because it means my team has a long way to go from a 13 percent module (which is kind of what we produce day-in and day-out today) to where I believe the entitlement is, which is over 18 percent module efficiency. By the way, we've made a 16.1 percent module, so we know how to do it. We just have some more work to do to get it into production." He added, "The real advantage of cad-tel is not efficiency -- it's cost." Garabedian (after reminding us of public company disclosure disclaimers) said, "The bottom line is, by 2017, we'll be in the low-30-cents-per-watt range." 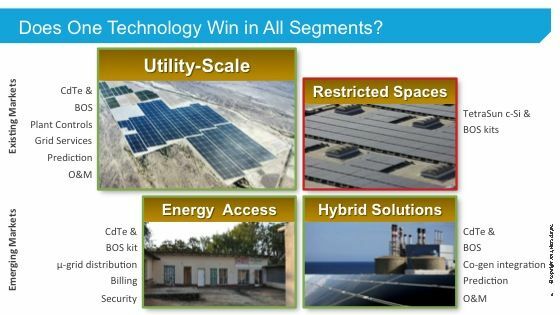 That figure is on the lower end of the production cost (not inclusive of cost of sales) which First Solar announced during its Analyst Day earlier this year. He added, "It's polycrystalline, so it's all about recombination losses at the end of the day for us. Everywhere on the device -- the front, back and middle. We do spend a lot of time working on lifetimes, a lot of time working on passivation, on interfaces, and on bandgap engineering these days." First Solar recently acquired GE's CdTe technology, allowing Garabedian to claim the current 19.6 percent cell record. 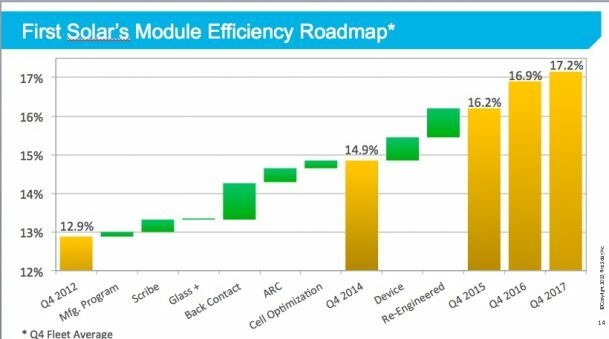 Garabedian said, "A 17 [percent] to 18 percent [efficient] module is within our reach with today's technology." Next, Garabedian talked about silicon solar technology startup TetraSun, a recent acquisition by First Solar. 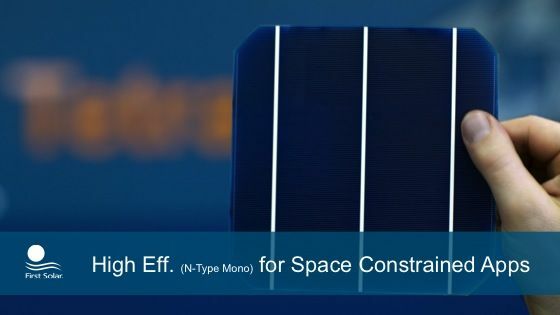 "TetraSun is a company we purchased to address space-constrained markets" with a high-efficiency, n-type mono cell technology, according to First Solar's CTO. The TetraSun cell is bifacial copper metallization built on n-type mono. "The core cell technology is a very unique passivation material system." 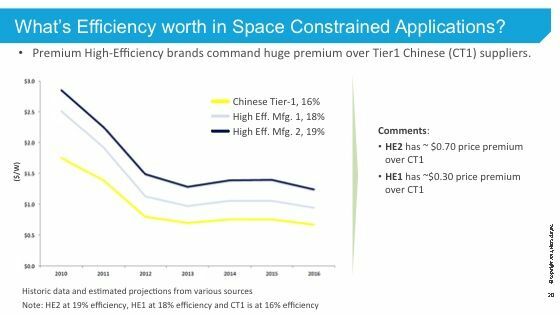 "The pricing premium is huge between Chinese Tier One" and high-efficiency mono at 18 percent efficiency and 19 percent efficiency -- 30 cents and 70 cents, respectively. 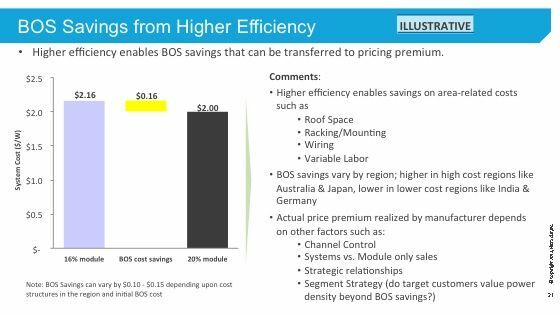 An analysis by First Solar shows that going from a 16 percent to a 20 percent module enables a balance-of-system savings of "16 cents, plus or minus 10 cents," depending on location. According to Garabedian, the rest of that 70-cent premium comes from channel control, systems-level sales, segment strategy and strategic relationships. 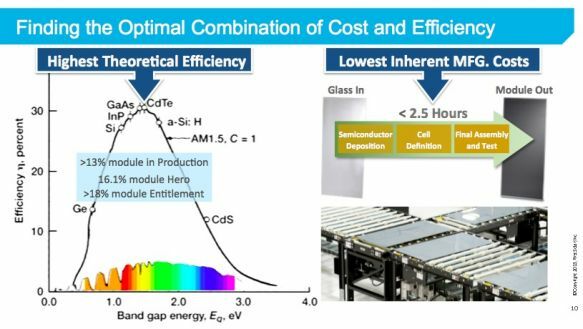 "So we're motivated to go out for a very high-efficiency cell technology -- but not at all costs," said the CTO, adding, "We intentionally didn't acquire a company that has an advanced interdigitated back contact cell that can get [First Solar] up to 23 percent. Why? Because I don't think I can afford all those process steps it takes to make that cell and still sell into these markets. 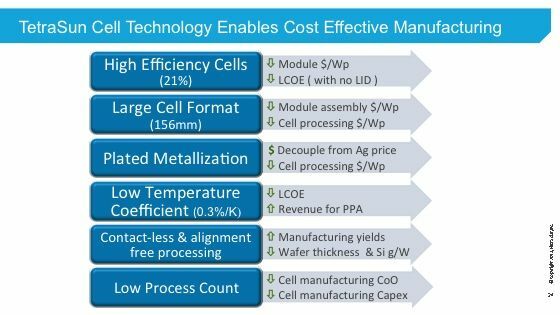 We took a very pragmatic approach to find the sweet spot between efficiency upside and the underlying cost structure of cell manufacture. We think we have that with this product." 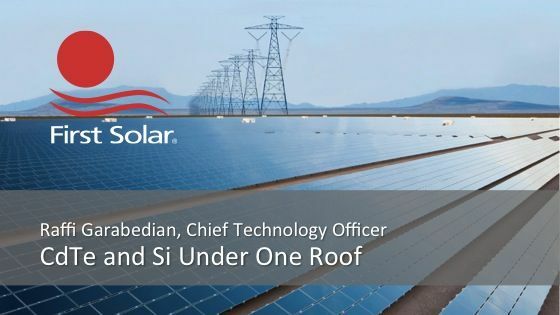 Garabedian said that First Solar looks forward to introducing the silicon product to the market next year. --"I think that we are looking at a future where most established PV companies are going to be unable to innovate internally, simply because the budget isn't there, because the margins are too thin. That's bad news for the industry overall. We're seeing it in China. 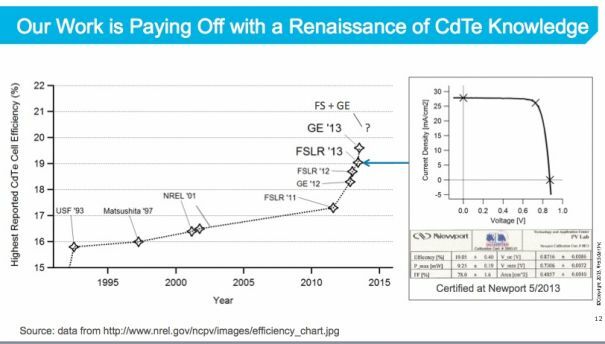 We're seeing an incremental approach to technology improvement -- which has taken us a long way, particularly in terms of cost. But it isn't going to take us much further in terms of performance and further cost reduction." --"The message I want to give [is that] this is an incredibly fruitful time to be a startup in core PV technology. If there are any investors with reputable venture firms, they'll say I'm crazy, because no one is investing in materials or devices or hardware of any kind." --"I want to see a lot of investments made in next-generation and future-generation PV technologies. There's room for innovation across the entire value chain and I think there's tons of room in [the] cell and module [spaces] -- and that's the piece of the pie where I see the least investment today. I see a lot investors going for the easy money, taking the easy way out in electronics and mechanics, stuff that can be developed quickly and turned quickly. But the hard work that needs to be done isn't getting done, because there's a lack of funding for it." --"I'm a huge optimist. I think we'll have 30 percent efficiency modules in ten years. I just don't know how we're going to get there. But I'm very eager to buy one."